Art is a powerful tool. It can make you laugh, cry, fill your heart with warmth, or run a chill down your spine. Art can move you, can scare you, excite you, or delight you. But apart from emotional effects, scientists are finding more and more proof that art can actually be physically good for you. Below we summarize several studies that suggest art can have positive health benefits for individuals as well as communities (with photos from ArtMoi Public). A recent study found that feelings of awe - brought on by art or nature - might help prevent diseases by supporting your body's defence system. Researchers found that the positive emotions produced by art were associated with lower levels of Cytokine. High levels of this protein have been linked to poorer heath and disorders such as diabetes, heart disease, arthritis and depression. This means that experiencing the feeling of awe from profound art could indeed be very beneficial to your health. Aqua Lungs by PA System. Photo by Joseph Visser. A researcher in the UK conducted a study where participants under increased stress spent 40 minutes perusing art. She found that their cortisol levels (the best indicator of stress) were reduced by 32% in that brief period. Normally, it would take 5 hours for cortisol to fall this much. All they had to do was wander around Guildhall Art Gallery in London during their lunch break. So next time you're under a lot of stress at work, consider taking a break to look at art. For many years, healthcare professionals have recognized that environment affects how patients feel and recover. In a pioneering study, researchers found that post-surgical patients recovered faster in a room with a view of trees, versus a brick wall. Since then, arts programming has been an important part of designing healthcare environments. Art can also be used to provide messages promoting healing. 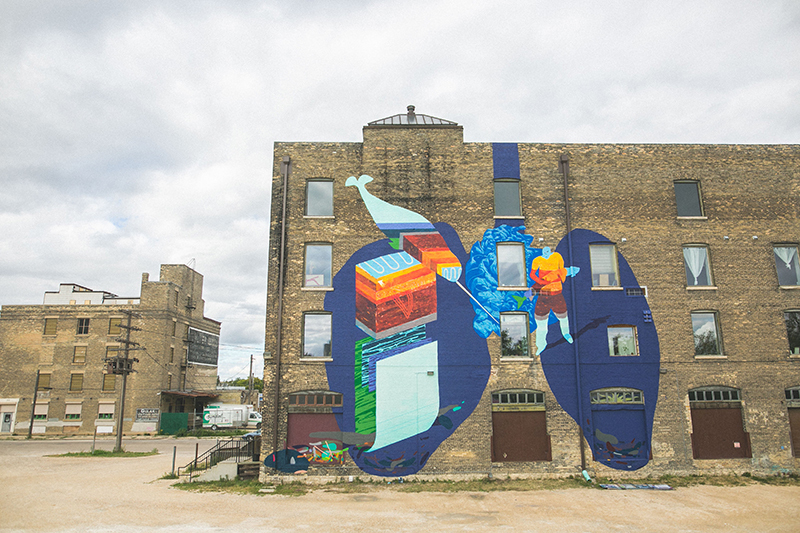 In Toronto, artist Jesse Harris created this mural saying "you've changed" directly across from the Center for Addiction and Mental Health (CAMH), to remind patients of their progress. Change by Ben Eine. Photo by Robert Skran. Public art creates gathering places, which encourage social interaction and fosters community feeling. In 2001, the Sunnyside neighborhood of Portland, Ore undertook an urban revitalization project. They transformed a busy intersection into a place where people meet and enjoy public art. Twice as many people in the area said that their neighbourhood is an excellent place to live, compared to other areas surveyed. Best of all, these people were also more likely to report excellent or very good health. In order to better reach youth and communicate health messages to them, Dr. Kevin Strong (paediatrician and clinician advocate) has started a new campaign called Dunk the Junk. He is using street art and graffiti to target teens who consume excessive amounts of sugar, in order to promote a healthier lifestyle. Public art can be a great way to target a large audience, and has been used successfully in the past to promote health messages.